During the rehearsal of the service, the E.I.C (Engineer-in-Charge) of AP came into CTR and turned off all the monitors, saying it was supposed to be secret. But as soon as he had gone, our S.Tel.E (Senior Television Engineer), Dicky Meakin, turned them on again, as he wanted his staff to know what was happening. Of course, had I done so (and been discovered), it would have been a most serious matter for me. But today, with a more enlightened outlook, what a find for the archive it would have been! But, it is lost forever. 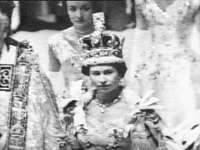 The "real" Coronation on the Tuesday was seen by millions of people all over the world. 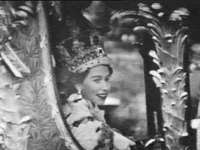 One event which many people remembered fondly was seeing Queen Salote of Tonga, riding in the rain in an open carriage. In this country the event, seen by almost all the population of the UK, was a great step towards making television the great and powerful medium it was soon to become. There was a small BBC single-deck bus, painted in "BBC green", which ran each morning from BH in the centre of London to AP, and we used to catch this near Baker Street. 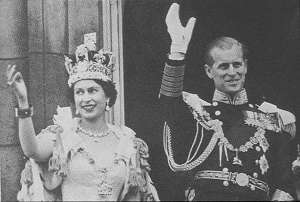 On the journey to AP on the morning after the Coronation, the driver said to me that he thought the previous day was "Television's finest hour". He was right! 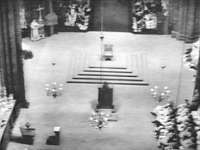 As the Coronation Service was being broadcast, a "clean feed" (a sound feed of the music etc, but without any commentary), was recorded on 1/4" tape at BH. However, shortly after the Coronation, one of my friends in BH had made a copy on 78rpm disks, from the clean feed tape, of this and some of the other music. These were in my collection for a while but disappeared years ago. If they still exist, and anyone knows of their whereabouts, a valuable addition to the archives could be made....? It was the practice in those days for the BBC to provide training for its technical staff at the BBC Engineering Training Department at Wood Norton, near Evesham, Worcestershire. The Dept was run by Dr K.R. Sturley who had formerly been with the Marconi Company. 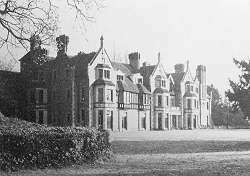 Wood Norton Hall had been bought by the BBC early in 1939 for use as an emergency temporary broadcasting centre in the event of war. I had recently moved out of the BBC Hostel in Bayswater, London, and found some nice digs on Crouch Hill, in North London, not far from AP. Then in the winter of 1953/54 I was detailed to a three-month course at Wood Norton. During my time there I would often return to London on a weekend, riding pillion on a BSA Gold Star motorbike of one of the guys, returning very late Sunday nights in time for breakfast and then lectures Monday mornings. Evesham is just over 200 miles from London, and in the centre of the fertile Vale of Evesham, a famous fruit and vegetable growing district, noted for the wealth of fruit blossom in early spring. However, we were there in winter, and memory recalls it was a hard winter and my presence on the back of his bike helped to keep it from sliding on the icy roads, especially going down that steep hill at Broadway five miles before Evesham is reached. The dormitory block was comfortable and I shared a room with a guy from sound radio, Keith Chandler. He could play the organ and we shared an appreciation of good music. On one weekend when I didn't return to London, Keith and I took a train ride to Hereford where he introduced himself to the organist of the cathedral and had a play on the organ. The canteen at Wood Norton was originally the stable yard and had been roofed over with large metal girders. Noticing this one day during a morning coffee break, I unwisely remarked to my companions that it seemed rather sparse here. Upon which the young lady sharply retorted "What Palace do you come from then?" Fortunately my other companion replied "Alexandra Palace!". "Oh, a real one...." she said, taken aback. It was the practice in those days that at the end of its time at Wood Norton each course would script and produce a radio programme which would be recorded and kept in the Wood Norton archives. Everyone was given a microphone test and I was asked to provide a jokey voice, but having a disagreement with the "producer", I declined. The precise details are now clouded in the "mists of time" but I do remember that one of the course members, who was not in the "cast", agreed with me. I do not have a copy of the resulting programme made by our course, but a fellow "resident" at the BBC Hostel had given me a copy of his course's programme on 12" direct-cut acetate discs. That programme was called "Focus on Technical Assistants" and was a take-off of a current documentary series "Focus" running on the Home Service at the time.